The Cameleon M is an ELIET innovation, combining a compact lawn vacuum with an optional shredder unit. 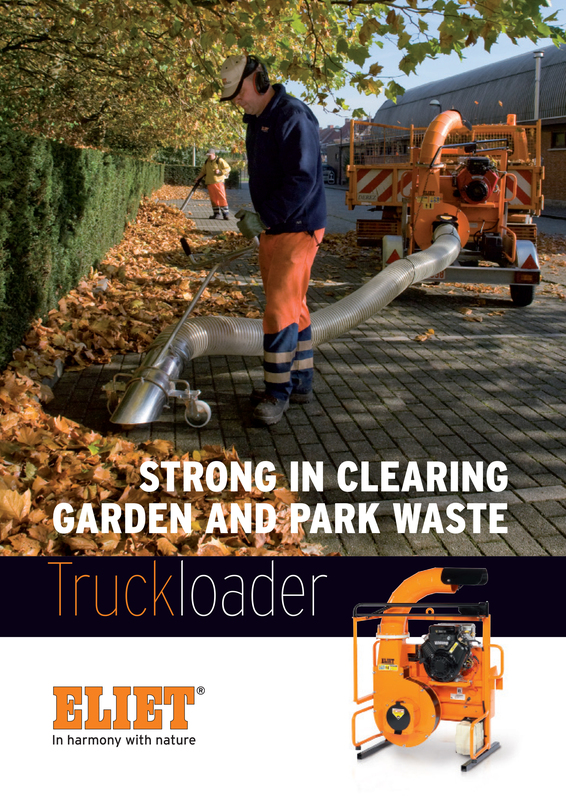 The machine is ideal for the individual user with a large yard and can be used in virtually any landscaping situation where yard debris requires disposal, such as clearing away leaves, trimming hedges, pruning flowers, and other tasks of similar nature. The Cameleon/M is equipped with a transparent vacuumflex vacuum hose. This light and transparent vacuum hose hardly obstructs the user’s freedom of movement and allows him to immediately pin-point and then remove any blockage from the hose. A special quick coupling system easily detaches the vacuum hose from the machine. It simultaneously activates the safety device, shutting off the engine. The collector bin can be easily cocked back and wheeled to any location for unloading. It can also be pushed forwards by means of the handlebars. The mesh net keeps the collector bin closed in and was designed for easy attachment and removal. Large pneumatic tyres ensure unparalleled operability over a diverse set of terrain. The Cameleon/M’s vacuum hose is attached to a swing handle. This hinged arm offers great flexibility to follow the movements of the user. For even more user comfort, Eliet developed a vacuum nozzle equipped with a small castor wheel. Now the user is not required to keep the nozzle uplifted, ensuring full freedom of movement. A long handle enables any user, regardless of his posture, to hold the nozzle in an ergonomically correct manner. The front swivel caster allows for proper manoeuvrability in zigzagging your way through tough-to-tackle areas of the lawn. For even more user comfort, Eliet developed a vacuum nozzle equipped with a small castor wheel. Now the user is not required to keep the nozzle uplifted, ensuring full freedom of movement. A long handle enables any user, regardless of his posture, to hold the nozzle in an ergonomically correct manner. The front swivel caster allows for proper manoeuvrability in zigzagging your way through tough-to-tackle areas of the lawn. The steel impeller is resistant to impact from rubble, drink cans, and other irregularly shaped objects. Furthermore, it is resistant to the scratching that can be caused by sand and dirt.